THE fabulous Felixstowe F.2A flying boat was an important WWI type, a top class aeroplane capable of lengthy patrols,strongly- built and well-armed,yet surprisingly agile despite its size and weight. Felixstowe boats and their crews operating from coastal stations such as Felixstowe, Great Yarmouth and Killingholme, performed excellent service, scoring a number of successes against German U.Boats,seaplanes and Zeppelins in the latter half of the war. For modellers, flying boats offer their own particular challenges and the F.2A is no exception;the highly colourful liveries many carried into battle only serving to make them doubly attractive. Jack Bruce provides a highly detailed narrative supported by over 95 photos-including many close-up detail shots- along with comprehensive captions,appendices and specification tables. 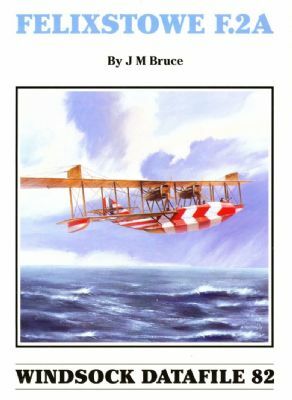 The page number has been increased to embrace Ian Stair's 1:48 and 1:72 scale drawings that take up a dozen pages;in addition, there are detailed colours' notes by Ray Rimell supplemented with two accurate side profiles and six scrap views showing colourful hull and wing float markings. This superb book, now in its second limited edition, is the go-to reference for modellers of the Wingnut Wings Felixstowe kits!